Please refer to our stock # 11002 when inquiring. This gorgeous vintage pin by Eisenberg originals is a classic design that's perfect for any suit or jacket lapel. It is 3 1/4" long x 2 3/8" wide and is cast from heavyweight sterling silver (71 grams). 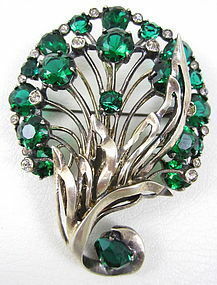 It has dazzling green rhinestones with clear crystal accents and the reverse is signed "Sterling" and "Eisenberg". The original gold vermeil is worn so it's more of a silver tone finish. The top green stone and the one on it's left appear to be replacements and show foil on the reverse side. It is not noticeable when worn and is an early repair. It looks great when worn and is affordably priced considering these conditions.